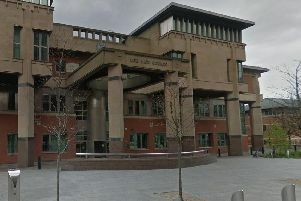 A man who strangled his partner after attacking her with a screwdriver at their Sheffield home told a psychiatrist he thought the woman he killed was a ‘decoy robot’. Jayne Lewis was found dead at her flat in Hazelbarrow Crescent, where she lived with Philip French, on December 21 last year. French appeared at Sheffield Crown Court this afternoon, where he admitted killing the 46-year-old mother-of-two. The 47-year-old was due to stand trial for murder but a lesser plea of manslaughter on the grounds of diminished responsibility was accepted. French, who is being treated by psychiatrists at Wathwood Hospital, was sentenced under the Mental Health Act to a hospital order with restrictions. Judge Jeremy Richardson said the sentence, which means the defendant cannot be released from the secure hospital until medics feel he is fit to leave, was passed to protect the public and French himself. Nicholas Lumley, prosecuting, told the court how on the night of the killing neighbours had heard Miss Lewis ‘screaming for mercy’, while French’s muffled voice could be discerned telling her to ‘shut up’. French remained in the flat for a day or more with her bloodied body, which he covered with a sleeping bag, until police gained access. Having killed her, he overdosed on medication and drank bleach in an attempt to take his own life. Mr Lumley said the couple had been together since they met in around 2004/5 and, according to Miss Lewis’ sister, he had 'treated her well’ for most of that time but it was clear he suffered from depression and had ‘terrible mood swings’. The court heard how in the days and weeks leading up to the killing, French’s condition had deteriorated rapidly. Earlier that month, Miss Lewis told her brother how she had to grab a samurai sword from the defendant’s hands to prevent him ending his life. He was diagnosed with recurrent depressive disorder, which is severe in nature, with psychotic symptoms. Miss Lewis’ daughter Laura, 25, with whom she had only recently been reunited after years apart, described her as ‘like my best friend or sister, with whom I would laugh all the time'. “I just want to be able to tell her again ‘I love you’,” she added in a heartbreaking statement which she read out in court.